On the 16th of July, Donald Trump and Vladimar Putin held a joint press conference in Brussels, both denying charges that Russia interfered in the 2016 election to hand the White House to Trump. 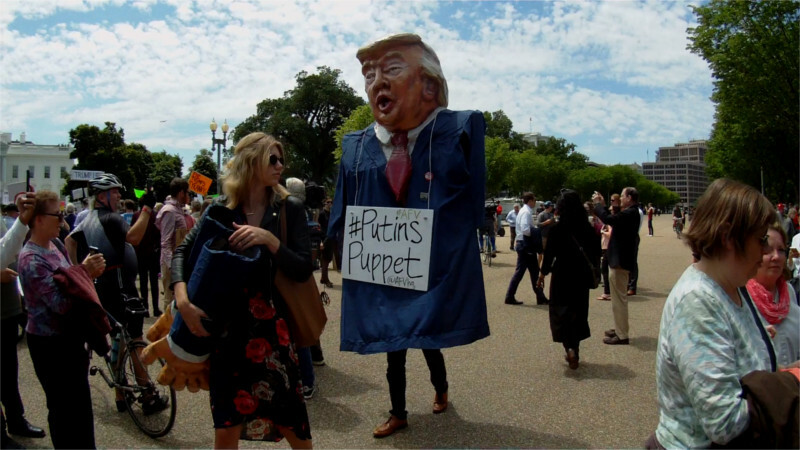 Beginning on the 16th of June, a largely new crop of protesters under the name Occup yLafayette Park was outside the White House, calling Trump a traitor for his dealings with Putin and demanding his impeachment. 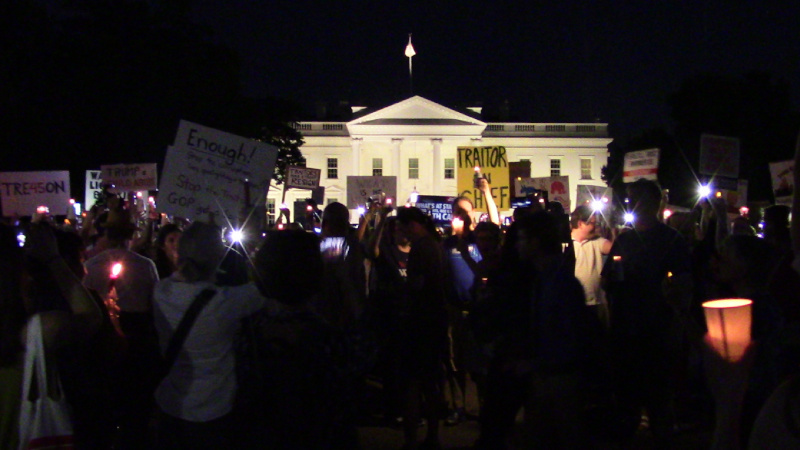 By the third night, growing crowds managed to create a "pitchforks and torches" atmosphere even using only candles. 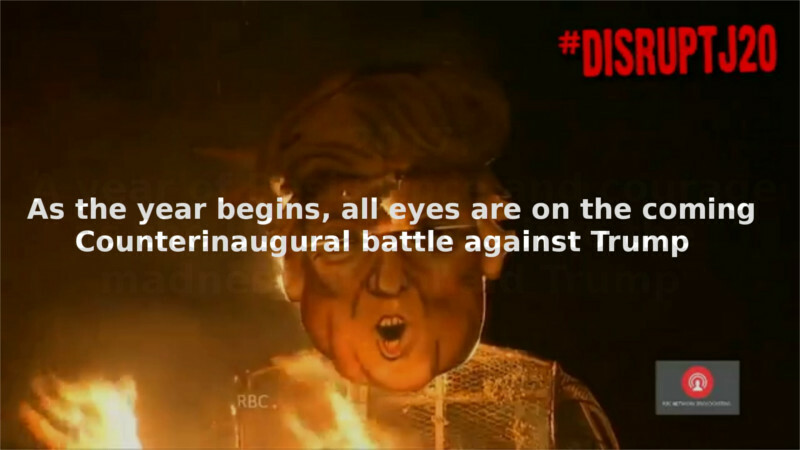 Video Night 2:police clear protesters from Penn Ave as Trump is called "traitor"
Furious with efforts to imprison comrades for up to 80 years each for the DisruptJ20 protests, anarchists burned US flags on the 4th of July. 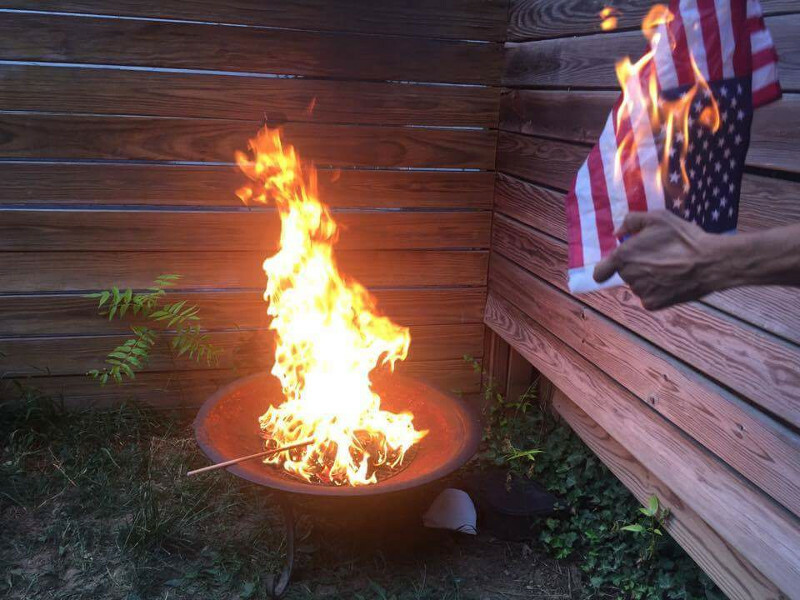 The USA flag now stands for Trump, for the alt-right, and for prosecutors like Jennifer Kirkhoff and cops like chief Newsham. 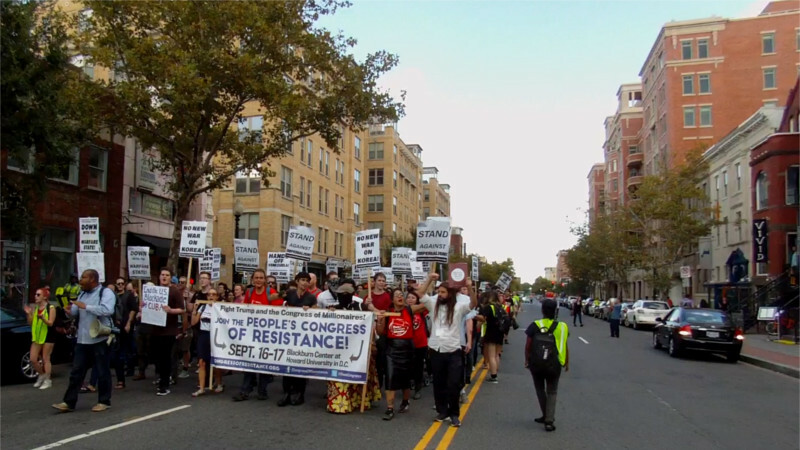 It has always stood for racism, and the US is notorious around the world for long prison sentences that violate international standards. The bicycle racks at Union Station in Washinton DC have become unsafe to lock a bicycle to, as bike thieves have removed many of the nuts holding the U-shaped racks to the concrete. In addition, many of them now have ordinary hex nuts, not the original security nuts holding them down. Anyone with a wrench can remove the hex nuts, and obviously someone is able to remove the security nuts as well. 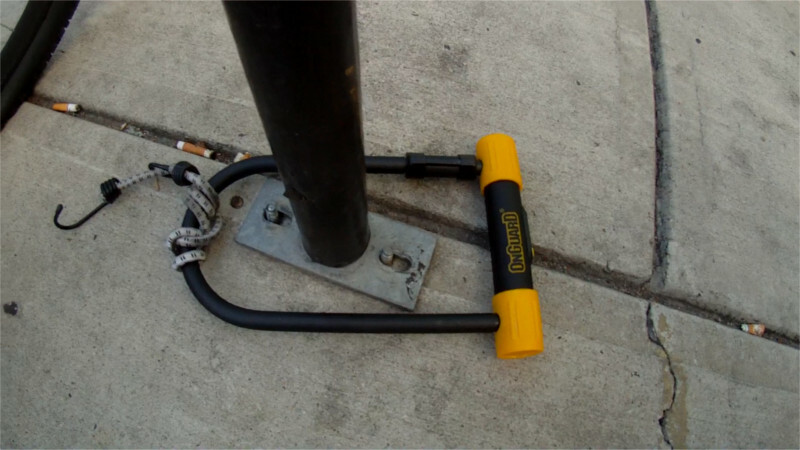 The steel bases on each end of the U sections are small enough to pass through a U-lock. On the 9th of May, Trump fired FBI director James Comey. It is generally believed this is due to his request for more resources to investigate "Russiagate," the suspicions that Trump had help from Putin in the 2016 election. 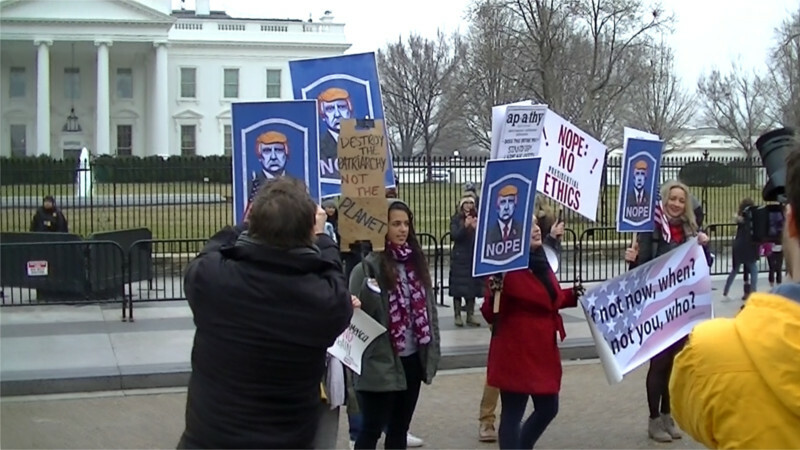 On the 10th of May, protesters gathered in front of the White House not to defend the FBI but rather against Trump. Some demanded a special prosecutor, others went further to demand that Trump be impeached. 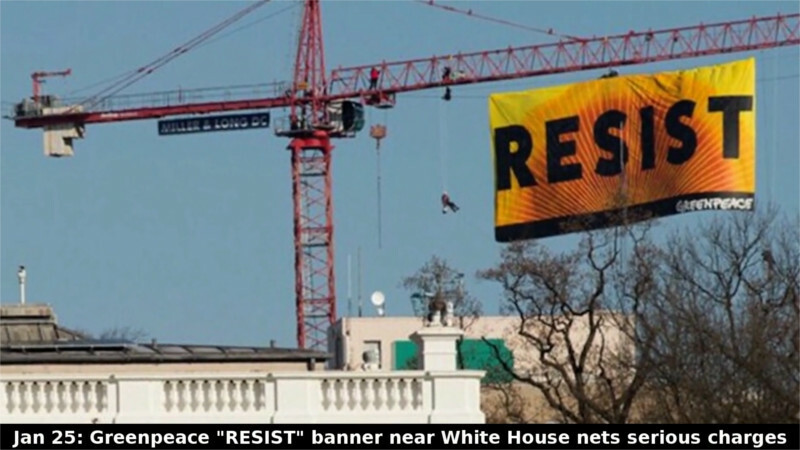 Protest and direct action against Trump's first three months in office, mostly in DC and starting with the pre-inauguration buildup to the massive DisruptJ20 protests. Mainstream media starting to talk about Trump's first 100 days, well here's our answer!